We just finished a full renovation of our hotel. We cannot wait for you to experience the new look of our property. 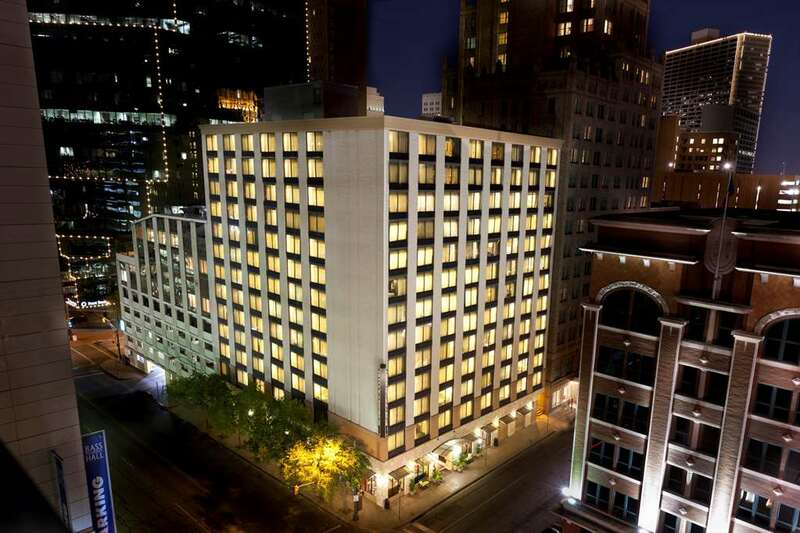 Daily Mandatory Charge will be added to the room rate and includes City mandated Tourism Improvement District Fee The newly renovated Embassy Suites Fort Worth - Downtown hotel is the only all-suite hotel in the heart of Sundance Square Plaza in Fort Worth Texas. This downtown location puts our Fort Worth Convention Center hotel in the city*s epicenter and only steps away from vibrant entertainment districts. Choose from 156 well-decorated suites Infused with an edgy contemporary style and expect facilities for both business and leisure travelers. Climb aboard Molly the Trolley the complimentary vintage-style trolley that stops at the hotel and takes passengers to shops restaurants and the Water Gardens. Start the day with a free made-to-order breakfast. Return home each evening to the Complimentary Evening Reception* serving cocktails and hors d*oeuvres. Enjoy complimentary WiFi and wired internet access throughout the hotel. Business guests stay productive in the BusinessLink business center equipped with fax and photocopying services. Host a meeting or event in modern meeting rooms with staff on hand to assist with coordination and planning. Enjoy an invigorating workout in the fitness room or cool off with a swim in the pool. Multi-lingual staff evening room service and around-the-clock Concierge desk help ensure a smooth effortless stay. Feel at home at Embassy Suites Fort Worth we*re committed to you. *Service of alcohol subject to state and local laws. Must be of legal drinking age.